Situated in the Kumaon Foothills of the Nainital District, Jim Corbett is the oldest National Park in India established way back in 1936 to protect the endangered Bengal Tiger. 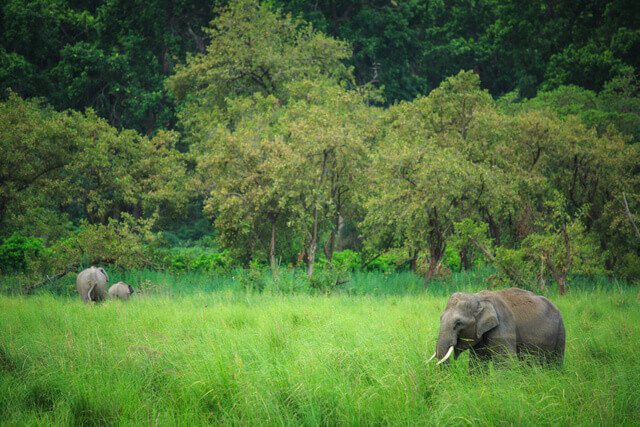 The park is also the most prestigious national park in India. It contains over 488 different species of plants, 110 tree species, 50 species of mammals, 580 species of birds and 25 species of reptiles. Every year more than 70,000 tourists visit this park spread in over 500 sq km. Jim Corbett is known as the father of Project Tiger in India. The park area comprises of hills, marshy depressions, river belts, grasslands, waterfall and a large lake. It's among the few tiger reserves in India that allows overnight stay. At a distance of only 260 kilometers from India's capital New Delhi and close proximity to one of the finest hill stations Nainital, Corbett is a virtual haven for tourists interested in nature and wild life. The trek to Jim Corbett is best enjoyed in winters as the high altitude birds migrate to the lower region and forest is in full bloom. The trek has an altitude variation of 450 meters to 2500 meters and presents a diverse variety to bird and wild life to the enthusiast trekker. Around 650 varieties of birds have been spotted in this region including the migratory variety. The trail takes us along beautiful scenic campsites and old colonial forest bungalows. We start along Kosi river through dense forest rich in wildlife and cross a few streams. The change in vegetation and landscape happens drastically as a trail through thick forests open up to deep gorges and beautiful scenic valleys. The highest altitude point opens up to a commendable view of scenic Himalayas laden with snow. Through our trek we will be constantly rewarded by ever changing bio-diversity and wild life on daily basis. Family and kids can be given pony rides for the entire trek. It's best to say with your guide at all times and follow his instructions to have a safe and fun filled adventurous trip as this area is abundant with Wild Life. The Trek begins from Kumeria in Corbett Park where a suspension bridge leads us to a village of Kumkhet over Kosi River. From here we follow the Kosi river upstream through a narrow irregular trail to the village of Okhaldunga which is about 9 kilometers from Kumkhet. We will have our lunch at Okhaldunga and from there are a few hours trail will lead us to our destination at Bawas. We will have refreshments and dinner as we camp overnight near the river amid the Jungle. Today we will camp at the small and pretty little village of Mona, which is nestled inbetween terraced fields. There is a primary school here. We will reach Mona after a long and exhausting walk over a broken path and through forests and bushes. We will camp near a stream a little ahead from the village. 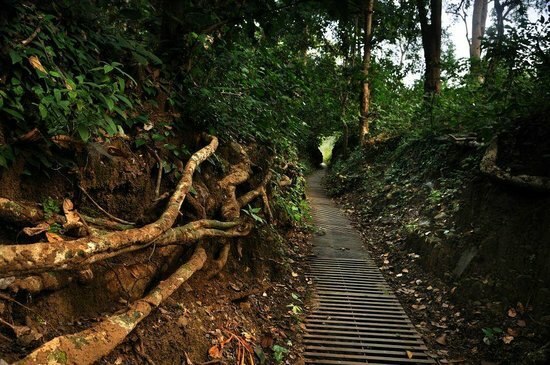 We will cross a stream over a bridge and climb steeply above a trail heading past some terraced fields and settlements. The long bushes will give way to pine trees. There is an old Forest Rest House here set amid pine trees in complete solitude and lap of nature. Breath-taking views of Nanda Ghunti and Trishul are visible from here. We will camp here tonight. Today will be a long day of the trek as we will meander through dense temperate forests of Oak, Chestnuts and Rhododendron. There will be a variety of birds, mammals including Magpies, Jays, Goral and even Leopard. The Rhododendrons will be in full bloom and will be in Scarlett Red. Halfway down our path we will come across a spot where we will stopover for lunch. The Forest and the stream look enchanted as speaking of a fairy tale at this place. The water is crystal clear and cool. From here our trek climbs gently through forests and then climb up to fields of Harinagar. We will halt for some rest here. Now we will pass across some homes and a school towards a pasture. From pasture there is a steep climb uphill to Kunjharak, we can either climb this short cut or take the more gentle path through a temple towards east on Jeepable road. Kunjharak is located at a high altitude and the weather could get quite cold here with an occasional snowfall. Their could be beautiful bird sightings from atop the higher ridges of Kunjharak of Lammergeir, Himalayan Griffon, Steppe Eagle and Kestrel. We camp at Kunjharak tonight near the Nursery of Forest Department near a water source. Today will be an easy walk on a level jeepable road towards Vinayak. In Winters you can expect snow on this trail. A little ahead on this trail we will view magnificent views of Himalayan Range. There are peaks like Nanda Devi, Trishul, and some peaks of Nepal are visible on a clear day. We will be walking over cushioned grass and thick forest. Their will be great views of Kosi River and the forests of Ramnagar and Haldwani. After reaching Vinayak (2600 meters) we will have some snacks at a tea shop and stay at the Forest Bungalow in comfy quilts and sleep beds before enjoying a nice home cooked meal. Trail to Pathariya would be towards the highest ridge of Vinayak and takes us through fine patches of cedar forests touched by several river streams. We will reach the ridge after about an hour of our trek and from here we can savor fine views of Himalayas. From here the civilization will thicken as we will cross several villages like Sigri and town of Pangot (2150 meters), Which served as an important trading centre in old days. It's a fine destination with some beautiful resorts and we could also do the same trek in reverse from Pangot till Kumeria or Kunjharak which will be an easier option if you are travelling with family and kids. From Pangot we can also take a few hours hike towards campsite of Pathariya through a dense forest offering a chance to explore rare wildlife like the barking deer and Koklass Pheasants. We will cross the popular Naina Peak (2600 meters), which is the highest peak in Nainital and you can savour fine views of the Himalayas from here as well as views of Nainital Town and Lake. 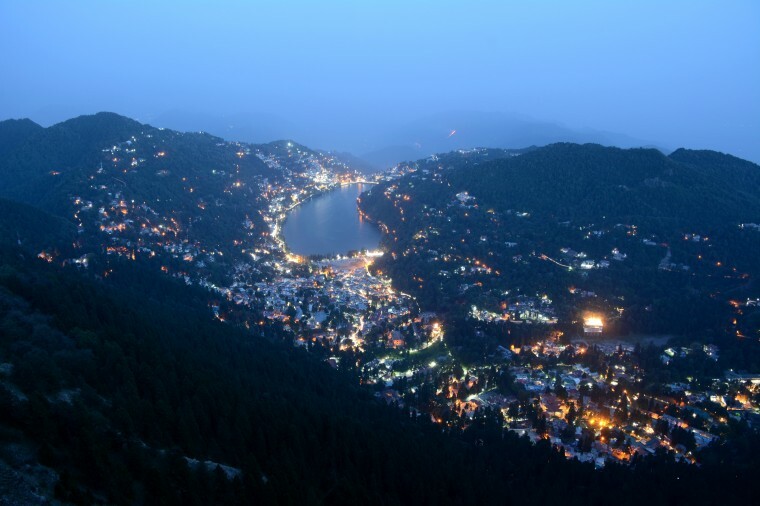 Head downhill to our camping site at Pathariya which also offers a bird's eye view of the Nainital Town. Today we will head for the beautiful town of Nainital from Pathariya. We can enjoy boat rides, shopping, and stay in comfortable hotels of Nainital as it's a few hours trek/short drive from Pathariya. The main attraction of Naintal is the Naini Lake, which reflects the spot where Godess Sati's eyes fell and is one of the popular Shakti Peeths. The temple is situated at the edge of the Lake. There are other lakes surrounding this area including Bheemtal and Nakuchital. Enjoy your stay in Nainital before we head back to Delhi with pleasant memories. Click here to know why you should take our services and what do we offer?